Welcome to our home in Melbourne! For over 50 years we have designed, developed and supplied exclusive products to the Australasian market. From our design studio and headquarters in Hawthorn, we are dedicated to supplying beautiful products to our customers that are affordable and made to last. As a premium homewares and lifestyle company, it is our desire to bring you quality products that will enhance the enjoyment of your home. 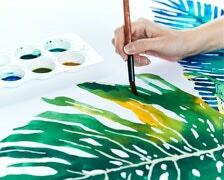 We aim to bring the wonderfully rich pattern and colour of the world around us into all of our designs and products. As a global company, we scour the world (be it Portugal, Turkey, China or Vietnam) searching for the most beautiful qualities to incorporate into everything we create. Our brand reflects our love of the land we call home, bringing the beauty of the modern Australian lifestyle to you. As an ever-expanding team, it is our continuous goal to make life in your home a pleasure. So go ahead… make yourself at home with Bed Bath N’ Table. 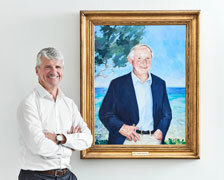 In 1960, John Dempsey founded The Dempsey Group; an organisation that would expand to encompass the Bed Bath N’ Table brand and the Domestic Textile Corporation. After returning home from his time in WWII, John worked for many hard years as a sewing machine technician. Acquiring a passion for textiles, he soon recognised a strong desire in a very early market for locally designed bed linen that truly encapsulated the Australian way of life. 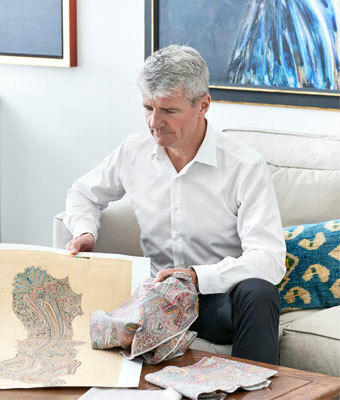 An intuitive entrepreneur, John formed a bed linen manufacturing and design business from a small factory in Brunswick, Victoria. From six sewing machines, business quickly began to grow. 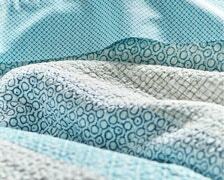 Carding, quilting and the manufacture of pillows, quilts and bed covers became the specialty of the company. A fact that still rings true for the business today. After supplying bed linen to some of Australia’s biggest department stores for many years, John realised a place was needed where the designs could be properly showcased in a specialty store dedicated to providing unique product and quality service. A place where beautiful homewares could become achievable to everyone, every day. This is how our very first Bed Bath N’ Table store was born. 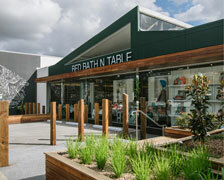 In 1975, Bed Bath N’ Table opened its doors in Dandenong, Victoria. The Bed Bath N’ Table name has since become forefront within Australian households for bed linen and homewares. Today, Bed Bath N’ Table remains a proudly Australian and privately owned family business with second and third generations of John working together to continue his vision. With over 160 stores in every state and territory of Australia as well as key location stores throughout New Zealand and Singapore, we have continually grown to become a full home lifestyle destination for our customers. There is no place more important than home and today we are still guided by John Dempsey’s belief that ‘a happy home inspires great memories’. At Bed Bath N’ Table, we are dedicated to the creation of quality products that bring pattern, colour and enjoyment into everyday living. We strive to help our customers enhance their homes with beautiful product and decorating ideas that make home living fun, easy and creative! Everything we Design, Innovate, Create or use to Decorate reflects this. The goal we have set for all of our store locations and website is to offer our customers a complete home lifestyle destination, where customers can find an inspirational environment and receive expert advice to easily visualise how our products will work within their home. We are passionate about making Bed Bath N’ Table a place where everyone can find what they’re looking for to create the home of their dreams. Inspiration can be found anywhere and our incredibly talented team of in-house designers find inspiration from all across the globe to create the beautiful pieces that are exclusive to Bed Bath N’ Table. From the deep Australian ocean to Turkish tile prints and Japanese textiles, our designers work tirelessly to bring the beauty of the world into your home. Our product design and quality is what separates us from others and brings our brands to life. Each season we are proud to carefully curate our collections to offer an extensive range of coordinating designs, making it easy for our customers to mix and match and find their own personal style. With 40 years of experience as distinguished manufacturers in the Australian market, we understand the complexities of our products and work together with our manufacturers today to achieve the best in quality. Our quality assurance team pays meticulous care to the construction, thread count, and finishes of our bed linen and they carefully survey the weave and fibres of our towels. Our textile ranges are put through rigorous testing to ensure they meet our required standards, and all of our tableware ranges are tested to Australian food grade standards. We use SGS testing laboratories across the globe to ensure the quality standards we have set are met. All of this means that we are able to offer superior products that can handle day-to-day use. We are excited to manufacture our products across the globe to achieve the finest results. Our manufacturers are constantly challenged to get the best results – whether it be a beautiful finish, a superb handle or an incredible reproduction of design – we are always on the hunt for the best of the best. We pride ourselves on our quality and, with this, comes regular inspections from our in-house quality team all the way along the process. All of our products are meticulously examined and reviewed by our team as we continually push to meet our customers, and our own, expectations. Currently our 160 retail stores can be found across Australia, New Zealand, Singapore and Online. Our passion for homewares continues through every facet of the business and our fabulous team are always at the ready to make your in-store experience relaxing, informative and inspiring! Our online presence offers a complete range of beautiful products, along with key destinations to help you feel inspired and creative. Visit our online Lookbooks, Blog, Instagram and Pinterest to find the latest products and ideas to help you transform your home. With more and more of our customers constantly on the lookout for exciting updates to fulfill their home living dreams, we also offer Bed Bath N’ Table Home Concept stores. These stores are larger in size and offer an extended range of products to cater to all of your home styling needs.